KYOTO - The kanji kita (北, north) has been selected as the character best capturing the national mood this year in Japan amid the heightened nuclear and missile threat posed by North Korea, a Kyoto-based kanji promotion organization said Tuesday. 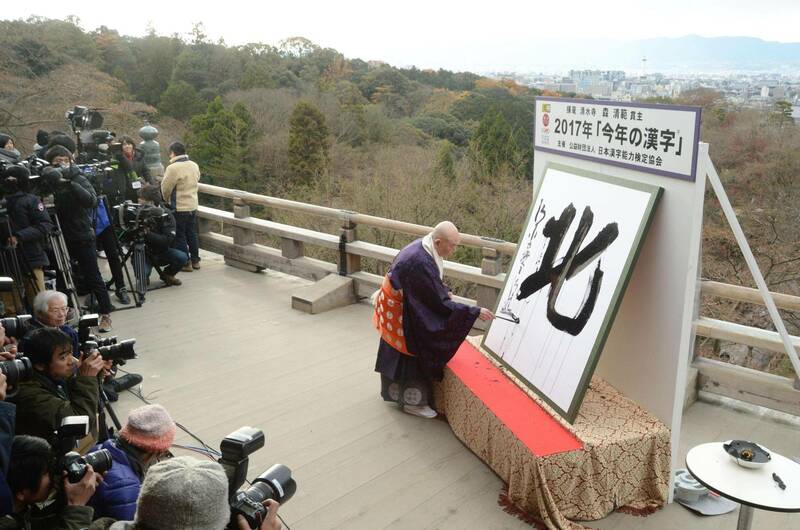 Chief Buddhist priest Seihan Mori of Kiyomizu Temple hand wrote the character with a large calligraphy brush on a massive piece of paper at the famous temple where this year’s kanji was announced. North Korea has continued to pursue its nuclear weapons and missile programs this year despite a raft of tough new sanctions, conducting its sixth nuclear test and launching a spate of missiles, including two that flew over Hokkaido. 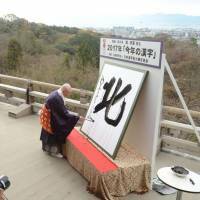 Last year, the Japan Kanji Aptitude Testing Foundation picked the kanji kin (金), meaning gold or money, after Japan won 12 gold medals at the Rio Olympics and former Tokyo Gov. Yoichi Masuzoe was forced to resign over a political funds scandal.